With the market in gridlock, Goldman Sachs has identified 30 stocks with big upside potential. Goldman says trade tensions and rate decisions “[have] made the environment difficult for stock pickers.” But don’t panic! For the best alpha generation opportunities, the firm recommends picking stocks that are more correlated with company specifics rather than general market forces. And so, the stocks highlighted by the firm boast “micro driven, idiosyncratic returns” making them perfect for the current climate. Plus I took this list one step further. I used TipRanks’ analytics to pinpoint the stocks with the most bullish Street outlook. As a result, all the stocks here have a “Strong Buy” Street consensus rating based only on the last three months. You can see for yourself the consensus take on these stocks from the included screenshots. So rest reassured that Goldman is not alone in its bullish take on these stocks. Broadcom Inc. (NASDAQ:AVGO) may not be the most obvious stock pick right now — but bear with me! The semiconductor space has taken a slap on the news that China plans to boost domestic chip production. Worries over flagging demand for the iPhone X aren’t helping either. However, Goldman Sachs sees big upside potential for AVGO of 40%. It gives AVGO a “dispersion score” of 2.5 vs the S&P median score of 1.1. And as our data shows, the rest of the Street is just as optimistic. We can see that in the last three months, 24 analysts have published AVGO buy ratings. This is versus just one hold rating. Meanwhile the average analyst price target of $321 translates into 40% upside potential. He expects the wired segment to come back strongly in Q2, with potential for double digit QoQ and 3% YoY growth. The icing on the cake — a $12 billion share repurchase program which could substantially improve earnings per share. Our second stock pick is Alexion Pharmaceuticals, Inc. (NASDAQ:ALXN) — a U.S. pharma stock best known for its development of Soliris, an extremely successful drug used to treat rare blood disorders. The company has just agreed to buy Sweden’s Wilson Therapeutics for $855 million, further boosting (and diversifying) its rare disease lineup. Although Singh does not give a price target, we can see from our data that analysts (on average) are predicting that Alexion will rise 49% to reach $158. This comes out just above Goldman’s 44% projection. In total, Alexion has scored 16 buy ratings and only one hold rating from best-performing analysts in the past three months. Texas-based oil and gas stock Noble Energy Inc. (NYSE:NBL) boasts lucrative assets in the U.S. and West Africa. These assets account to total proved reserves of 1.9 billion barrels of oil equivalent (BOE) — producing an average of 343,000-353,000 (BOE) per day throughout 2018. Given this analysis, who can be surprised that this “strong buy” stock has received 12 recent buy ratings? This includes a couple of upgrades to boot. Only one analyst is staying sidelined right now. Plus, even though shares are at the high end of their 52-week range, the Street still spies 30% upside potential. And Goldman Sachs is even more bullish, projecting 45% upside. The firm is forecasting a 41% price spurt for this giant beer stock. Molson Coors Brewing Co (NYSE:TAP) has now completed the $12 billion takeover of Miller Coors. This makes it the third-largest brewer by enterprise value in the world, with a prime position in the $111 billion U.S. beer market. Now the stock stands to gain from deal synergies, which should improve cash flow further down the line. At the same time, Molson Coors is also working to tap the popular craft beer market by expanding its craft offerings. Indeed, premium beers like Belgium Moon and Coors Banquet significantly outperform other beer segments. Plus in the background we have President Donald Trump’s tax cuts which shave TAP’s rate from 35% to 21% — further freeing up cash. Right now, FCF guidance for 2018 stands at $1.5 billion plus/minus 10%. “We continue to see value in TAP shares, despite the challenges from ongoing volume decline” writes Susquehanna analyst Pablo Zuanic. He argues that “the investments made in 2017 should lead to improved global trends” and expects TAP to outperform consumer staples this year. His $93 price target is in line with the Street- and indicates 26% upside potential. Welcome to our second Texas-based basic materials stock. Goldman Sachs is forecasting huge upside potential of 77% upside potential for this “strong buy” stock. If you don’t know Newfield Exploration Co. (NYSE:NFX), this is a company that focuses on “liquids-rich unconventional resource play” mainly in the U.S. On a one-month basis. this stock is doing very well — up 19% on the back of rallying energy prices. If we turn to the Street, we can see that this is a favorite name in the basic materials sector. “With recent share price performance and expectations, we add NFX to our Top Picks on the back of our positive view into 1Q18 and remove EGN given the recent outperformance, tightened valuation gap and 1Q18 expectations” writes William Capital’s Gabriele Sobara. Ten analysts have published recent buy ratings on NFX with two hold ratings. Their average price target works out at 26% upside potential. Global medical device company Align Technology, Inc. (NASDAQ:ALGN) scoops most top-performing S&P 500 stocks in 2017. Shares exploded from $96 to $223 during the year. So say hello to Align’s clear removable aligners that look set to transform the orthodontics industry — and goodbye to traditional braces. Shares are currently jumping thanks to better-than-expected earnings results. As international continues to outperform, Align has the power to outgrow competition, writes Piper Jaffray analyst Matt O’Brien post-earnings. He believes that there is further upside potential to management’s ramped-up guidance and tells investors to forget the “premium valuation” and buy-in. His $300 price target translates into 22% upside potential from current levels. Goldman Sachs, meanwhile, is predicting a 25% growth spurt for prices. Overall, six out of seven analysts are bullish on ALGN, with Credit Suisse’s Erin Wright saying Align remains “well ahead” of peers in terms of innovation. “Strong buy” stock Centene Corp (NYSE:CNC) is a multi-line enterprise that provides services to government healthcare programs. Following strong Q1 results on April 24, five-star Oppenheimer analyst Michael Wiederhorn reiterated his $130 price target (19% upside potential). 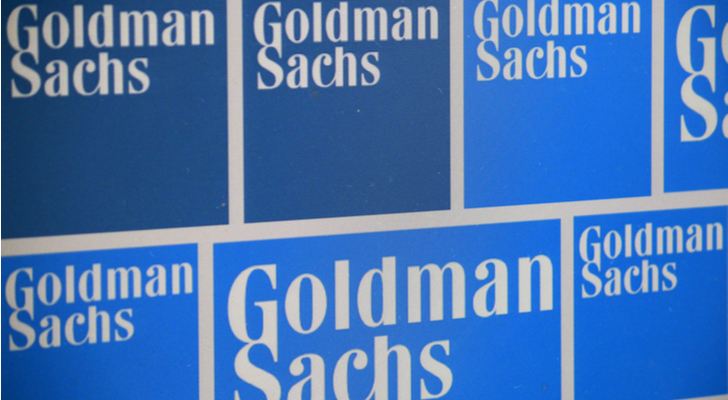 Goldman Sachs is incrementally more upbeat with a 25% upside guidance. Centene reported EPS of $2.17 handily beating Street expectations of $2/$1.92. The overall Street picture on Centene is promising. In the past three months, CNC has received four buy ratings (with BMO Capital’s Matthew Borsch calling Centene a favorite name in Managed Care) and one hold rating. TipRanks offers investors the latest insight into Crypto via its powerful CoinWatch platform, as well as eight different sectors by tracking the activity of over 40,000 financial experts. As of this writing, Harriet Lefton did not hold a position in any of the aforementioned securities. Article printed from InvestorPlace Media, https://investorplace.com/2018/04/goldman-sachs-7-stocks-set-to-rip-higher/.